Let me just say, for the sake of argument (and I fully expect some), that a contraption lies between your gizmos and your mechanisms. Now your gizmo is likely smaller than a bread-box, with no moving parts; your mechanism is often bigger than a breadbox, and has moving parts and some sort of separate power supply. So, logically, your contraption has moving parts, but is powered directly by the user, which means that, as like as not, a contraption will pinch you and it's your own damn fault for not working it right. Is this perfectly clear? Good, let's look at a few contraptions from the collection. Cranks are a sure sign of contraption status. From our 1910 house collection, the harmonious functionality of the wood, rubber, and iron components of this laundry tub wringer belies its sinister ability to flatten little fingers. What child could resist the siren song of such a handle situated so perfectly within reach? Then there are the gears and little brother's wandering hands. 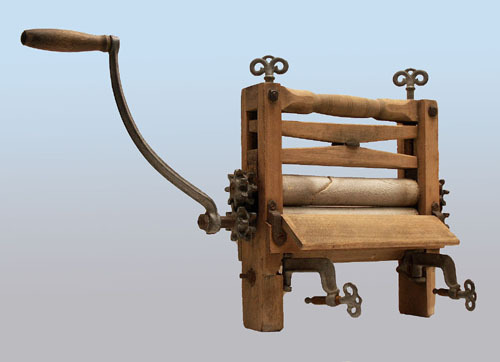 No wonder it is also called a mangle. Multi-use contraptions have always been associated with children. 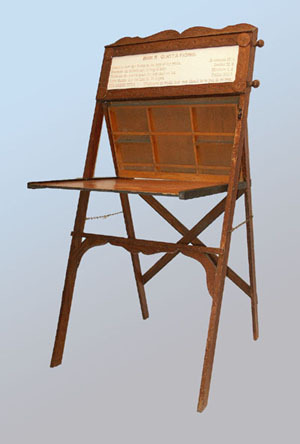 This folding desk/blackboard also has a picture window at the top within which a paper scroll can be, yes, scrolled down for a variety of learning aids, like Biblical quotations, geometry proofs, shorthand notation, etc. The desk top flips up to become the blackboard. In the pop-up view, the black and white buildings in the scroll window were from the Chicago Columbian exposition of 1893. Chalked on the blackboard in a young hand are the names of eight girls, who were likely friends of Josephine Allen, the blackboard's mistress, who died in Springvale, Maine, in October of 1906, from appendicitis at age 10. Her parents preserved intact and undisturbed every vestige of their only child. With the seat in the fully upright and locked position, this high chair has its legs firmly planted on the floor to withstand the turbulence of feeding Best Beloved. 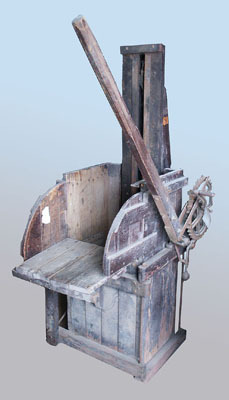 A pull on the knob that projects behind the seat releases a lever that allows the seat to descend, the leg angle to change, and the four cast iron wheels to shoulder the load. Best Beloved could then be rolled into the corner to think things over. Lower the chair. The lever action is stiff, tending to drop the seat too far; it probably works smoother when smeared with squeezed banana. This model can be found in the 1902 Sears & Roebuck catalogue. From the Steen Co. tin shop in Bath, this grooving machine, ca. 1900, crimped together the edges of sheet metal sections rolled into various diameters for stove pipe. Keeping one's shirt cuffs and knuckles from being snagged by the teeth of the moving cross-bar would have been a lesson quickly learned. Folding chairs have always been prone to pinching the unwary. The maritime type, often called a deck chair, was useful because it was simply packed up and stowed away as the deck became less congenial. 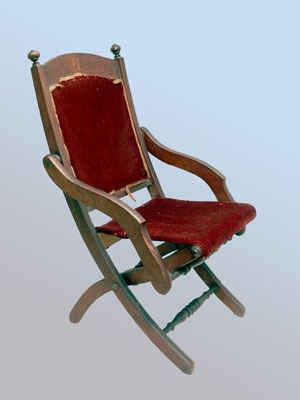 This velvet-upholstered version has a monogrammed "R" emblazoned on the back rail, and is associated with Capt. Rufus Randall of Freeport. 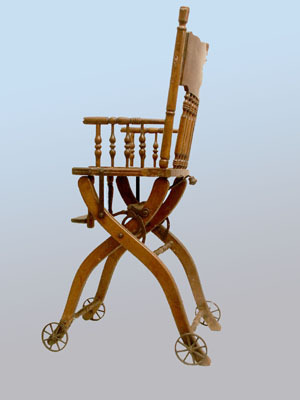 It is easy to see this chair fitting into the following scene from a Randall diary, Sept. 9, 1874, aboard ship Oasis from NY to England: "Fine weather, poor trade winds varying from NNE to NE by E. Bar. [ometer] low. People employed painting about decks. Carpenter caulking poop. Sailmaker making royal. Annie tending Baby. Myself reading Jane Eyre and soldering coffee maker, etc." An elegant ablution appurtenance to wake to before groping up the companionway. 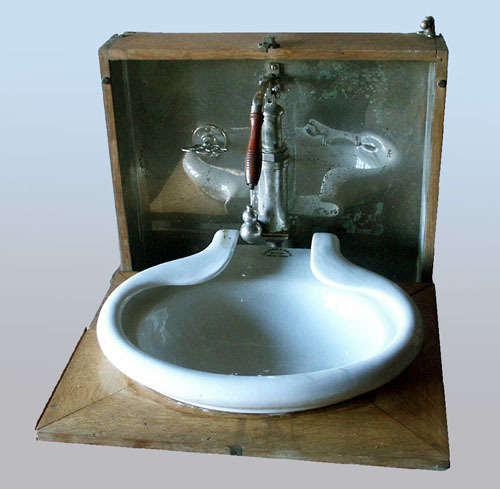 Water is drawn into the bowl by pumping on the lever handle; toothbrush stows in holder to left; by gazing in the nickel-plated mirror liner, the urge to shave can be suppressed. The in-turned rim assures minimal sloshing; the sink is emptied by tipping it up. Don nautically natty headgear and turn to for coffee in the cockpit. A small label affixed to the varnished oak cabinet reveals the maker as A.B. Sands &Son, New York, "est. 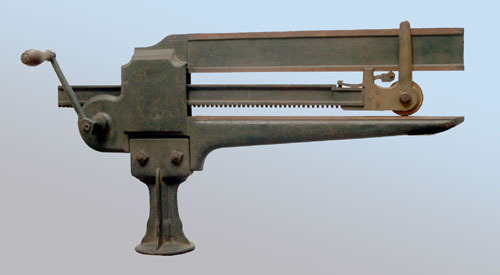 1849". 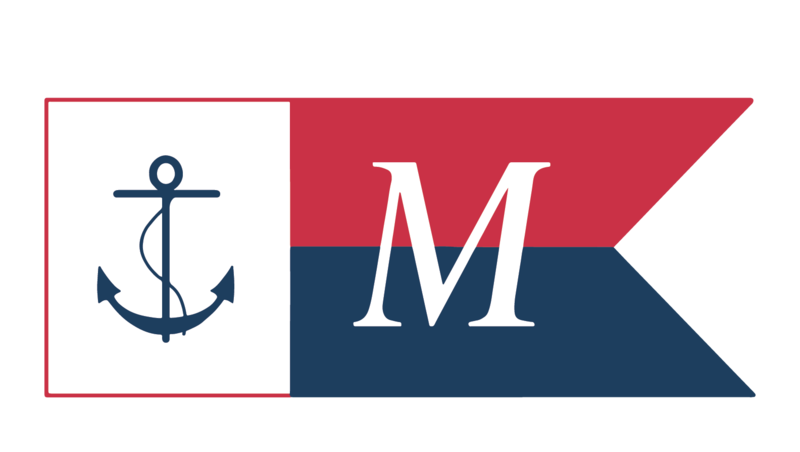 This firm also had a long line of marine toilets. By 1936 they were offering the "Florida Electric Closet," that operated, "with or without current". No coffee 'til you stow the sink. Whether in airliner, Pullman rail car, or steamship, the perpetual war between passenger comfort and available space has spawned numerous amenity contraptions. This chestnut-paneled lavabo or washstand likely fit into a small state room aboard a steamship. In addition to the fold-down sink, which drains back against a splash board and down into either a separate bowl or tank (missing), a bottom drawer drops down with evidence of a shoe shining stand. Water to supply the sink was poured into a concealed galvanized tank, the top lid of which is seen raised just inside the top compartment of the unit. Fold-in coat hooks side-mounted just under the cornice complete the ensemble. For such a designed object, it is frustratingly devoid of any manufacturers mark. Careful archaeology of the water tank residue revealed a 1908 series "Franklin one cent" stamp, and an Indian-head penny (dis-continued 1909), which reveals about when the tank ceased to be filled. Also in the tank was a playing-card-size voucher, printed in Yiddish, with some hand-written filled-in blanks. 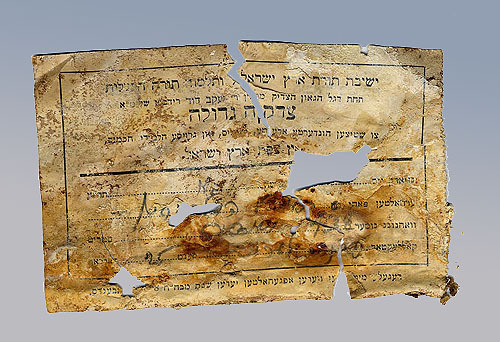 My Yiddish consultants have discerned that the voucher was a card of introduction for the bearer from one shtetl or synagogue or rabbi to another. When the ship rolls, things start crashing around. 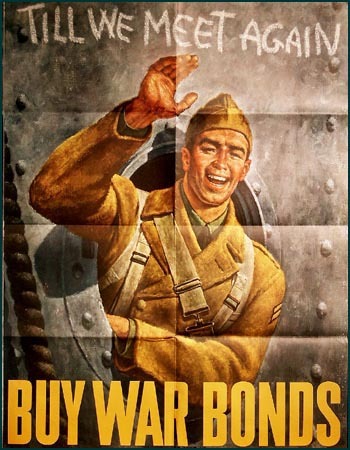 The temptation for the a last look at the receding shore of home, as the troopship shouldered into the first ocean rollers, may have caught many a farm boy a smart knock on the back of the head as the porthole cover swung around. The resulting scramble to secure the unfamiliar sequence of locking dogs would have added insult to injury. 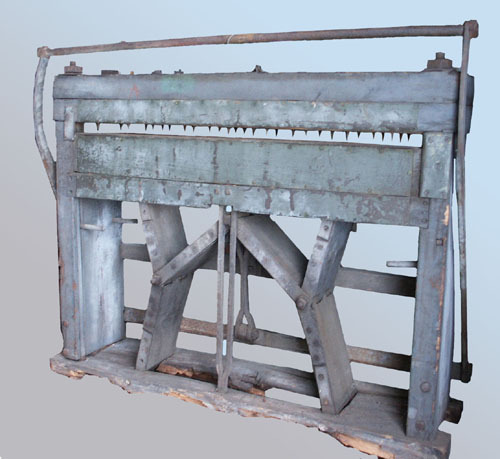 While the mechanism of this baler device is evident, the mystery to us lies in its greater place in the operations of the Hyde Windlass Co, the longtime Bath marine equipment foundry. The "plunger" was cranked to the top of the upright, the material to be compressed (paper? rags?) was dumped in, and the long lever ratcheted the stack downwards. The front and sides swung open to extract the bale. This wooden rig is more akin to the hand-cranked cider presses, bean hullers, and other agricultural cousins of its day than the belt-driven metal-working machinery at the foundry. Built to pierce copper ship sheathing with multiple pilot holes, this rare piano-sized device is assembled from hand-made wood and forged-iron components. Despite the disintegration of its base, the action is intact: as the cross bar pulled down, the lower bed is pressed up into the rows of multiple points by the wood and iron linkages underneath. 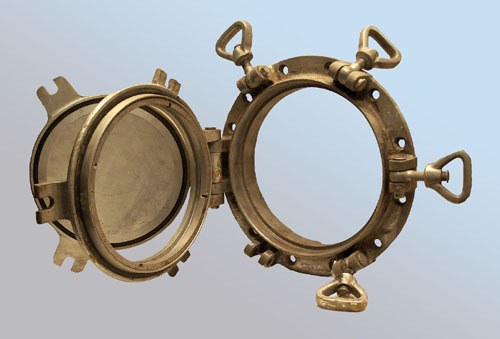 This contraption was found in the Percy & Small shipyard, but the schooners built here by the 1890's were using mixed copper bottom paint to deal with marine growth. With a couple of exceptions, "yellow metal" sheathing had become out-moded. The pre-industrial characteristics of this press lead us to believe it was likely used in Bath shipyards of considerably earlier decades when copper sheathing was still being applied. 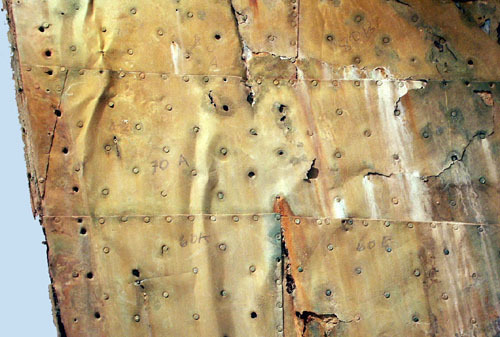 The pattern of the holes made by such a device can be discerned above, in the copper alloy sheathing nailed to our bow section of the 1851 clipper ship Snow Squall. Note the difference of the contraption-pressed diamond pattern of each sheet's center compared to the hand-punched edges.